German Shepherd Studs in Ontario, Von Aries German Shepherds Home of THE BEST German Shepherd studs in the whole of Canada and some of the finest dogs in the German Shepherd world. Our males produce puppies that are full of temperament, vigor and vitality - German Shepherd Puppies For Sale Ontario - Ontario Breeder German Shepherd Breeder | German Shepherd Puppies For Sale Ontario | German Shepherd Pups | German Shepherd Breeders Ontario | German Shepherd Puppies | German Shepherd Studs in Ontario, Von Aries German Shepherds Home of THE BEST German Shepherd studs in the whole of Canada and some of the finest dogs in the German Shepherd world. Our males produce puppies that are full of temperament, vigor and vitality. They sire dogs with excellent heads, color and pigmentation. We pride ourselves in having this quality available in Canada and making it accessible for other breeders to utilize. ​Von Aries German Shepherds Offer Stud Service out of some of the Best Males Available in North America and the Very best Male German Shepherds for Breeding in Canada. Our dogs have Substance, Credentials AND WORLD CLASS Pedigrees. Our dogs have some of the Best blood lines the German Shepherd World has to Offer. PRODUCING Puppies and DOGS WITH SUPER TEMPERAMENT, EXCELLENT DRIVE, SUPERB ANATOMY, CORRECT SIZE, WITH MAGNIFICENT PIGMENT, DEEP RED and black COLOR with Amazing personalities and character. VA Negus vom Frankengold . Negus is one of the Top Stud Males in North America and the best Stud Male German Shepherd in Canada. At the age of just 3 years old Negus has Achieved more than most dogs his age will in a Life Time. Negu's pedigree is the combination of some of the best line world has to offer. Negu's mother is the mother and grand mother to some of the Top placing dogs in the World his pedigree speaks for itself. Large, well-pigmented, very expressive male with very good building conditions and well-shaped hea . Well-trained high withers and toplin . The croup is long and well supported. Very good angulations with solid joints. Rear stepping, forward slightly narrow step and step sequences. With good powerfully-reaching gate. The last year very well-placed in the Young Dogs Class Male. Ork is a son of world famous V Figo vom Nordteich a top Son of world Champion Remo vom Fichtenschlag, Orks mother is Piavom Napte-Emmer-Eck daughter of VA Quaivom Status quo who so a son of World Champion VA Vegas du Haut Mansard. 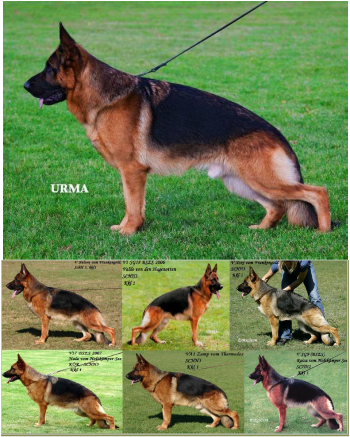 Making ork a G.son and G.Gson of two the most influential Sires in the German shepherd world, both have produced numerous world champion. Ork's has an open pedigree which means that there is no line-breeding what so ever make him open to all the line. Ork will make a great impact in an breeding program. Large male with super pigmented male. Very good top line and very good underline. Excellent proportions. Extremely powerful with excellent movement and reach. Very straight coming and going. Very promising young male. Quanton is Son of V Pakros vom Pendler his mother is a daughter of VA2(CH) V24 BSZS Maestro vom Osterberger-Land. Quanton has some of the most sought after and rarest bloodlines World has to offer. Large, powerful, full-bodied, built in a very good relationship, solid, dry, strikingly expressive, very good pigmentation. Very strong, praiseworthy proportioned head, top, underline very good, fore and hind angle correct, shoulder blade position very good, strong formation, well-balanced breast, straight front. Good tread, shows dynamic gears with very good Ground Coverage. Striking type and expressive, with harmonious overall appearance, particularly good head-pores. Suitable for improving the overall anatomical structure, in particular the embossing and the type and the expression.